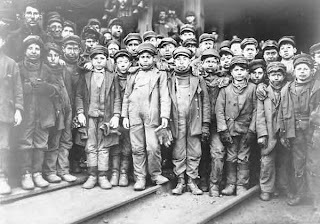 Although child labour was to arouse the strongest of emotions during the Victorian Era, it was certainly not a new phenomenon. In England children had always worked although, while Britain was a primarily agrarian society, much of the work was “hidden,” being in the fields and a part of a family’s work structure. From the middle of the eighteenth century, a number of factors combined to make child labour more visible and more dramatic. As I. J. E. Keil has noted, “ ‘Industrial Revolution’ became the commonplace characterisation of the complex developments in Britain during the later 18th and first half of the 19th cents.” With the advent of the steam engine and its application to factory production there was accelerated movement from animal power to machine power. The development and rapid expansion of railways, dependent for their motive power on steam, contributed to the distribution process, but at the same time allowed for the movement of people. Movement to the urban centres was expedited by a series of Parliamentary Acts in the later years of the 18th and the early years of the nineteenth century which accelerated the process of enclosure. Indeed, in the eighty years between 1780 and 1830, more than 4,000 local acts were passed and between six and seven million acres or just over twenty percent of the land area of Britain was enclosed, forcing many smallholders off the land. Many of those who left the land were forced into factories, Blake's "dark Satanic Mills." Here workers, especially women and children, were exploited. Children especially were useful where the industrial processes required access to those parts of machines which were too difficult to be reached by the larger adults. Children were cheap and were always available since their small earnings were often just enough to make the difference between survival and starvation for a family. In Lancashire alone, 30,000 children a year were employed in the mills in the 1830s. Children were in demand, as well, in the mines where they could squeeze through small openings and were often harnessed to wagons full of coal to pull the loads to the surface. Some of the voices of the working children can still be heard in the 1842 Report of the Children's Employment Commission. John Riley worked in a pin making factory. At the time he was interviewed, he was eleven years old, had been in the workhouse for six years and had been making pins for five years, having started when he was six years of age. He worked from 9 to 12 and from 1 to 4 and in addition to which he worked after supper two or three times a week. He told the interviewer that he never got beaten; even if he failed to do the quantity of pins that was expected. John Edelsten of the firm of Edelsten and Price, pin manufacturers, noted, in testimony, that the children working in the factory were of the lower class and their families "could not afford to do without the produce of their children's labour, however small." He went on to say that if the children did not work, "the parents of most of them must come on the parish for relief." Ellen Clark, who worked for a tobacconist had begun working as a tobacco stripper at around the age of ten. The work entailed the stripping of the wet leaves and “laying them smooth in a row.” At first, the smell was so unpleasant that she threw up, but in a few days she became accustomed to it. The smell, she said, “makes all the children ill at first.” Her workday began at 7 o'clock in the morning with a thirty minute break for breakfast at 8:30 and an hour for dinner at noon. At 4 o'clock she had half-an-hour for tea. She went to Sunday School for most of that day finishing at 8:30 in the evening. Ellen told the interviewer that she “never gets to walk out in the fields even on Sundays,” but of course that day was taken up with schooling. She did have a few holidays during the year; New Year's Day, Christmas Day and Good Friday and, on those days she went to Church and to school. Those were, however, her only holidays. John Froggart was eleven years old and worked at the Shipley Pottery where he had been employed for three months. For turning the wheel he received 3s per week. His work day began at six in the morning and ended at six in the evening. During the day he had half an hour for breakfast and an hour for dinner. He got his meals on the premises where he had meat, potatoes, bread, and beer for dinner. Although he had attended Sunday school for four years, he was still doing the Easy Lessons. Even for those children who were slightly older, the work must have been hard and dangerous. Frederick Cave was fifteen years of age when he testified and had been working in the Machine Rooms of a Lace Manufacturer. He worked from ten to twelve hours a day and often, in addition, he might work all night two or three times a week, finishing at six in the morning before returning to work at eight. His father had died two years earlier and “he was forced to look out for his own living.” Although he had a little school and now attended Sunday School, he could barely read and couldn't write, signing his testimony with his mark. I know one little lad who is employed at pulling out the planks which have been pushed through the machine by men, and he has one hand now on which only the thumb is left. Then there is the lemonade-bottling, which is another industry largely employing the lads of poor neighbourhoods. The bottles are liable to burst, and cases of maiming are almost of daily occurrence. To see a portion of the 1842 Report on the use of child labour in the mines, including some horrific images, click here.